CHICAGO -- Two juveniles are in custody after a Jeep that was stolen at gunpoint last week from the Avondale neighborhood crashed Monday morning on Chicago's West Side. At 4:23 a.m. Friday, a 46-year-old man was warming up his 2002 Jeep before work in the 2800-block of North Rockwell Street when he was carjacked at gunpoint, according to Chicago police. The suspects drove off in the Jeep and were last seen heading north on Rockwell, police said. At 8:52 a.m. Monday, Harrison District officers on patrol were behind the stolen Jeep in traffic in the 500-block of South Kedzie Avenue, police said. 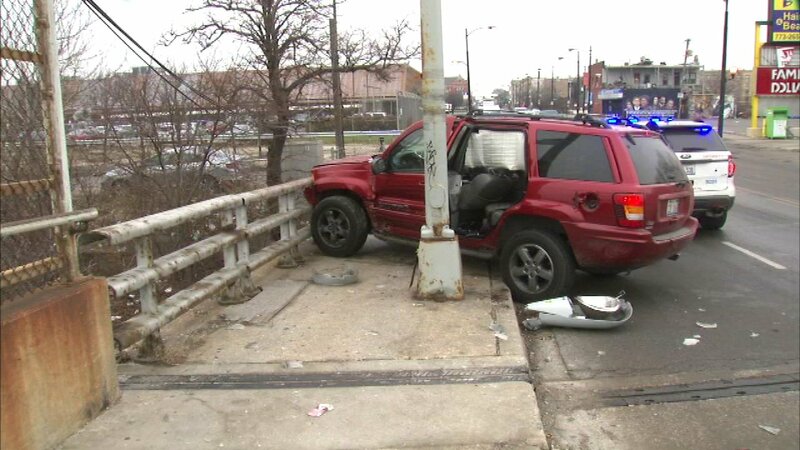 The Jeep took off and crashed at Congress Parkway and Kedzie, police said. Two juveniles were taken into custody and two weapons were recovered. Charges were pending against the two juveniles Monday afternoon.